Actually there are several styles of badminton grips but only two basic grips that mostly used, forehand grip and backhand grip. Every badminton stroke can be done by these kind of grips. The others are merely variations of those badminton grips to get more powerful and effective hit shot. Experienced players use the two grips interchangeably according to what kind of shot they will play : forehand smash, backhand smash, netting and so forth. They are able to shift grip from one style to other style very fast as if they only use one grip style along the game. While for beginner players, usually they will be trained how to do the forehand grip first and then the backhand grip. Choosing proper grip when hitting the shuttle is very important because it can improve the quality of your stroke and fasten the shuttlecock shot. It means you use your power efficiently and effectively. You can’t merely rely on the strength of your wrist since using wrong grip will reduce the stroke power although you have strong wrist. We can summary that high quality stroke is produced by combination of correct badminton grips and strong wrist. 2. Hold the badminton racket head with your non-playing hand so that the handle points towards you and make sure the racket face or strings is sideways or perpendicular to the floor. 3. Hold the racket handle with your playing hand as though you are lightly shaking with it or as though you are lightly holding a blade, such as knife. 5. Your three fingers, middle finger, ring finger, and tiny, hold your handle. Your pointer is a little bit separated from them and put your thumb between your three fingers and pointer. Do not hold on the racket handle tightly but rest loosely to get more flexibility. 2. Hold your badminton racket as you would on a forehand grip. 3. Move V shape leftwards by turning the racket anti clockwise. 4. Put your thumb on the wide side of the handle to get greater leverage and power. 5. Lowering down the index finger to a position below your thumb and as forehand grip, the handle have to rest loosely in your fingers. 1. Materials. The most common choices are Polyurethane (PU) synthetic grips or towelling grips. PU is good material for comfort as well as absorbing sweat and shock. Towelling grip is commonly made by cotton which is excellent material for absorbing sweat. 2. Size : thin grip and thick grip. 3. Functionality : replacement grips and overgrips. Replacement grips are thicker since it replaces the original grip. The original is a grip already wrapped to the racket handle when you first bought the racket. Towelling grips are always replacement grip because they are very thick. Overgrips are thinner (less than 1 mm). 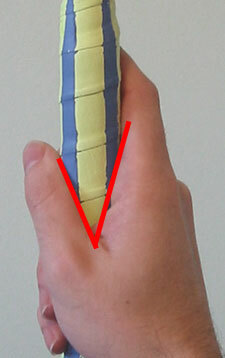 This grip is used to wrap over original or replacement grip. Basically, grip choice is a matter of personal preference. It’s often relied on your palm size and the amount of sweat flowing from your arm. a. If you find your sweat becomes a problem and prefer to change the grip more often, then overgrips will be more convenient. It can be removed more rapidly without damaging the underlying material. That’s why this grip is commonly used as final layer grip. A player may build up the handle with one or several grips before applying the final layer. – original grip + PU replacement grip. – original grip + PU replacement grip + PU overgrip (if you have bigger palm size). – original grip + PU overgrip. – original grip + PU replacement grip (if you have bigger palm size).